Instant Pot Honey Garlic Chicken Wings are sweet and sticky and using the pressure cooker, can be on your table in less than 30 minutes! Wings, wings, wings. 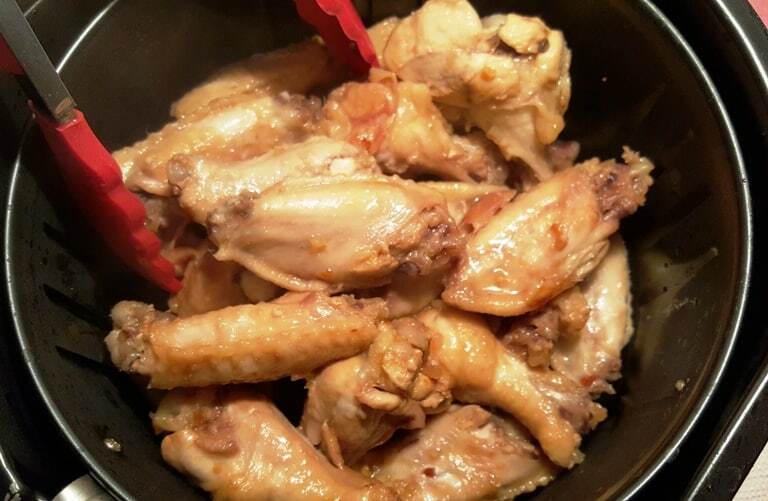 They are so popular these days and today I bring you Instant Pot Honey Garlic Chicken Wings (or Thighs or Legs). I remember as a kid, the wings were the cheapest part of the chicken. Well, actually, chicken was so cheap. I never liked chicken much and chicken wings were not a “thing,” like they are in today’s World. How many restaurants offer wings on their menu? There are so many varieties. So many in fact, that there are restaurants who specialize just in Chicken Wings. 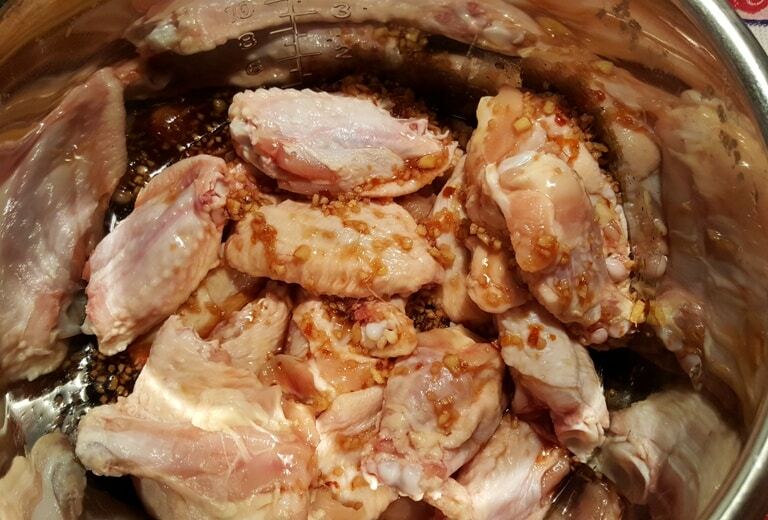 Using my Instant Pot Smart Pressure Cooker for wings is great, as I can have the wings on the table in less than 30 minutes. 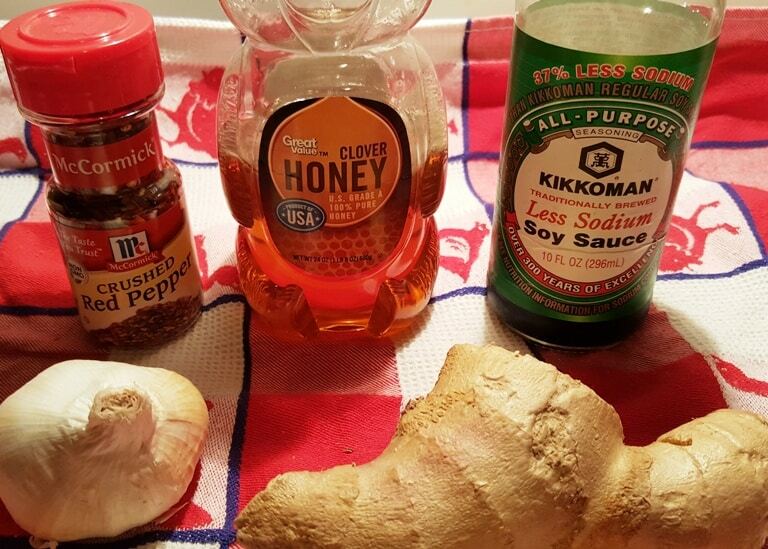 Honey Ginger is always so popular, so I thought I would do a Pressure Cooker version. It’s an easy recipe and you can finish off the wings in your oven or your Air Fryer. I prefer using my GoWise USA 5.8 Quart Air Fryer for chicken wings, as the skin gets nice and crispy, without getting charred. I also like the texture of the meat better, using the Air Fryer. 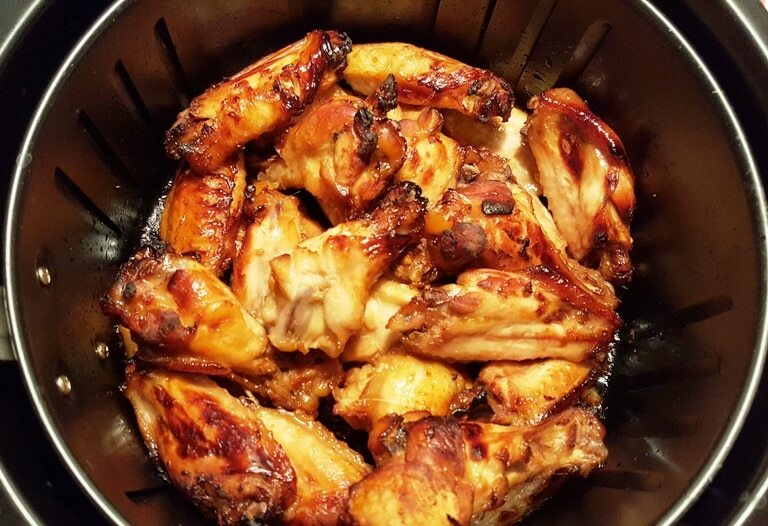 For a totally different take on Instant Pot Honey Garlic Chicken Wings, please see my Air Fryer Crispy Honey Garlic Chicken Wings. It is one of the best recipes I have ever created. The photo alone will grab you! 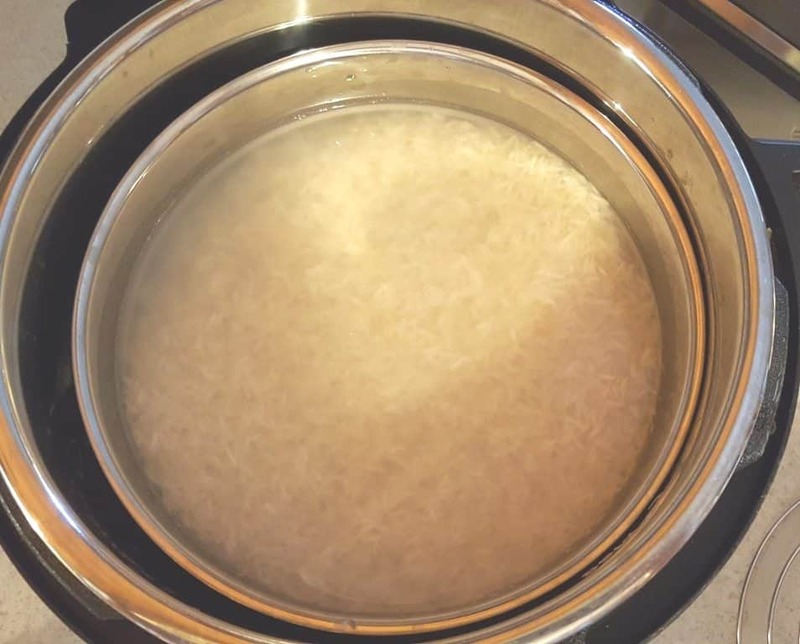 If you would like to cook your rice at the same time and in the same pot with your Pressure Cooker Honey Garlic Chicken Wings, Thighs or Legs, please check out my Pressure Cooker Perfectly Cooked Pot In Pot Rice recipe for step by step instructions. 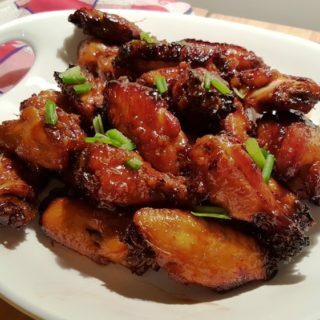 Turn this Pressure Cooker Honey Garlic Chicken Wings, Thighs or Legs recipe into a one pot meal! 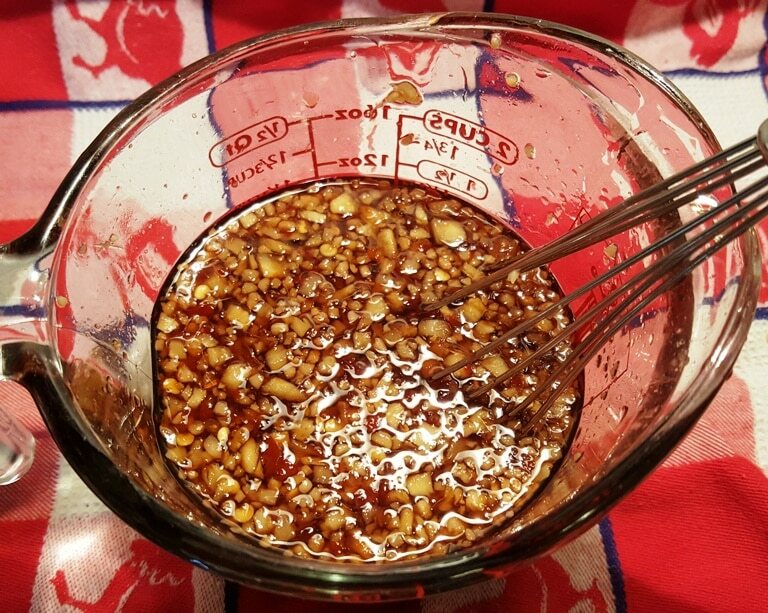 I use a Glass (Liquid) Measuring Cup to mix up the sauce and then whisk it well, so that it is evenly combined. Make sure your wings are nice and dry. If you see any feathers, pluck ’em out. Ewwww! I use Kuhn Rikon Kitchen Shears to cut my wings into pieces, but feel free to leave them whole. I do a breaded deep fried chicken wing with an apricot sauce that is to die for! 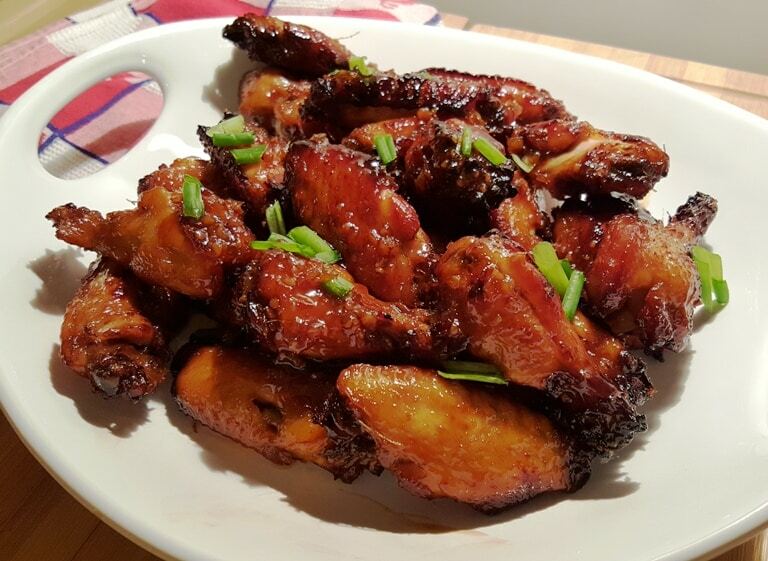 You may also like my Bourbon Honey Chicken Wings or my Buffalo Hot Wings. My favorite Chicken Wings are my Air Fryer Crispy Honey Garlic Chicken Wings, which are super crispy and delicious. Add the wings to your Pressure Cooker cooking pot. Dump in the sauce over the wings and swish it around to cover the wings. Lock on the lid and you are good to go. Open the pot and remove the Pan of rice. Place the lid on top of the rice to allow it to continue to steam and finish the cooking process. While the rice is steaming, go on to the next step. Your rice will be perfectly cooked by the time the Instant Pot Honey Garlic Chicken is ready. 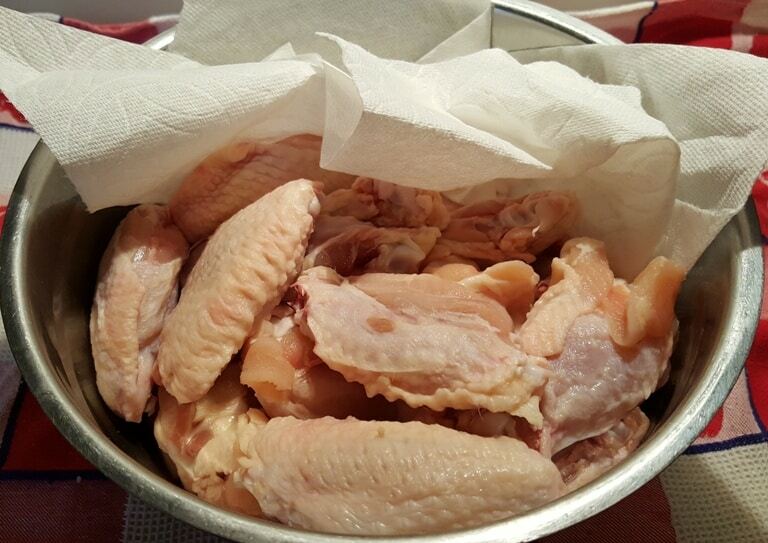 Carefully remove the wings from the sauce and place them either in the air fryer or the oven to crisp. Here they are in my GoWise USA 3.7 Quart Air Fryer. If you want to use the oven, line a Baking/Cookie Sheet and line up the wings. In the meantime, use your Sauté or Browning button on your Pressure Cooker and cook down the sauce until it becomes slightly thick. I do 10-12 minutes in my Air Fryer, then shake at the halfway point. For other brands of Air Fryers, you may have to cook a bit longer. Under the broiler, cook about 5-6 minutes each side, or until nicely browned. 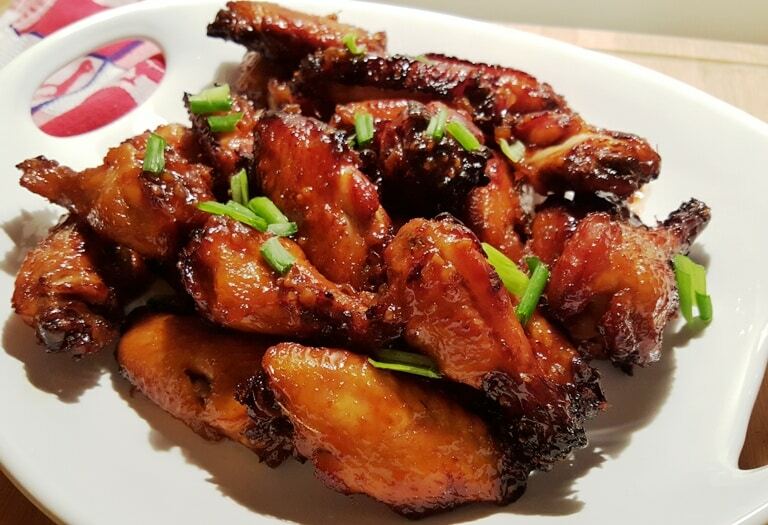 Check out my Asian Ginger Chicken Wings, so you can see the oven method and results. When the sauce has thickened, either dunk the wings back into the sauce and plate, or put the wings back into the Air Fryer or under the broiler for a few more minutes and then plate. Drizzle the remaining sauce on top. Garnish the Instant pot Honey Garlic Chicken Wings with scallions and serve with Thai Triple Coconut Rice and/or Pressure Cooker Mashed Cauliflower. 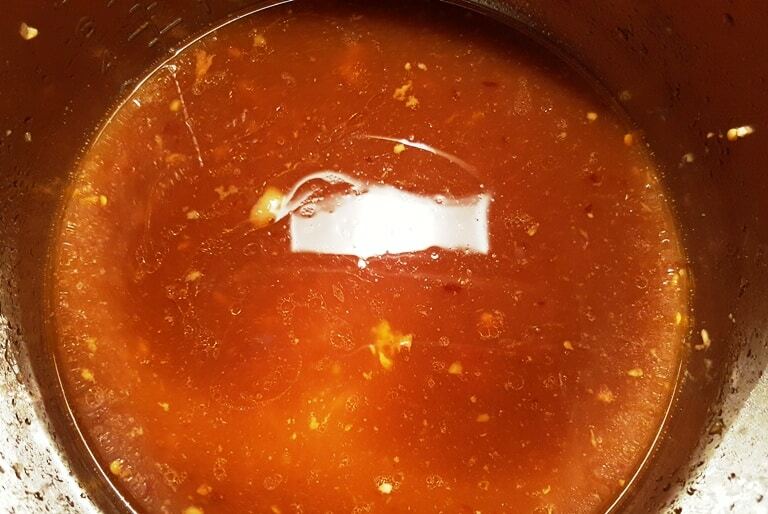 Add wings to your Pressure Cooker cooking pot. Mix up sauce ingredients and pour over chicken wings. Cook on High Pressure for 4 minutes. When Beep sounds, allow a 10 minute Natural Pressure Release. 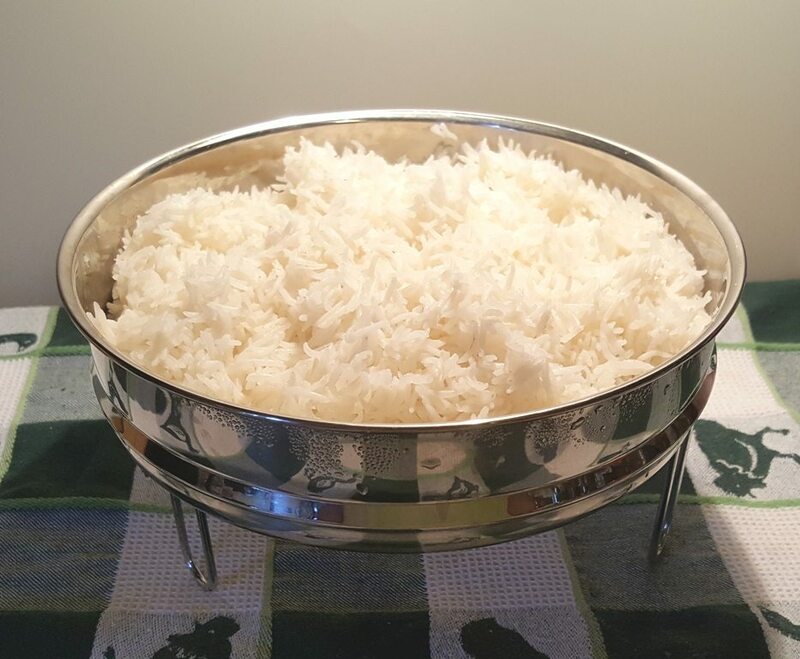 Remove rice and trivet (if using). Quickly place cover on rice to finish steaming. With tongs, gently remove wings from the Pressure Cooker and place into the Air Fryer Basket or onto a cookie sheet to broil in the oven. Cook at 400 degrees Fahrenheit for 10 minutes, shaking after 6 minutes for the Air Fryer or 5 minutes each side for under the broiler. Meanwhile, turn Pressure Cooker to Saute/Browning and stir sauce until thick. Bone in Thighs and Legs cook for 7 minutes with natural pressure release. Bone in Breasts cook for 6 minutes with natural pressure release. Boneless dark meat, cook for 4 minutes with natural pressure release. Boneless white meat, cook for 3 minutes with natural pressure release. If using frozen meat, cook time will be the same, but, after pressure is released, you will need to cook down the water, which frozen chicken deposits. 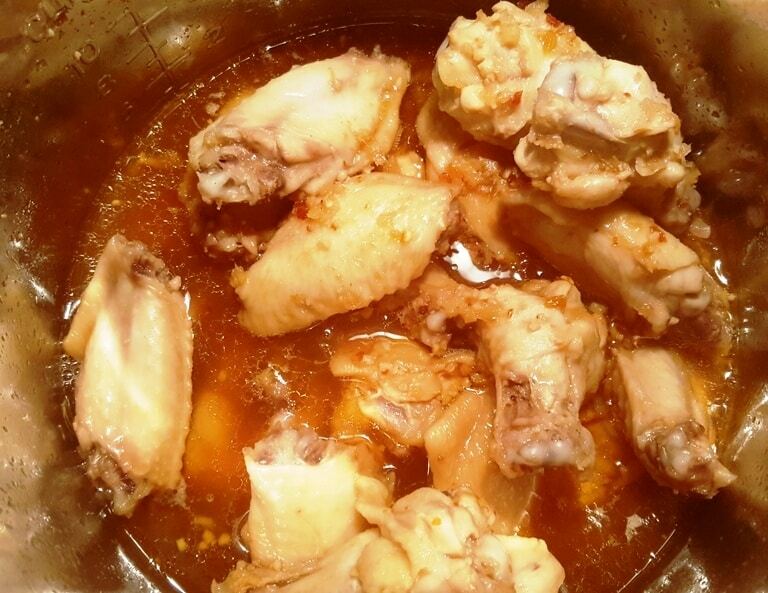 PIN this Pressure Cooker Honey Garlic Chicken Wings Thighs Legs! Hi thanks for the recipe. It doesn’t say one way or another if it’s OK to throw the wings in frozen do I need to thaw out? All the recipes we have used with the IP have said to use thawed chicken. It says at the very bottom of the recipe card that you can use frozen, but will have to cook down the water in the sauce. These are terrific! Just finished making them (drumsticks and burned my mouth because I didn’t want to wait till they cooled slightly. Also made PIP rice. Thanks for a great recipe. It was very delicious! My family really loved this! Thank you for sharing the recipe! I’ve made these before and they’re delicious! Now I want to make them for a family party and can’t make them on the same day as the party. I only have a small air fryer. Could I make a bunch of batches ahead of time and reheat them and then sauce them? Or, could they be made in the oven? Delete my previous comment, please. I wanted to comment on the air fryer board. I was wondering the same thing Marsha. This is a great recipe as are most of the others I have tried, but,while I have nothing against people making money on their internet sites, your site has so many ads on it that is too slow to use even on a new laptop (leave alone a lowly tablet). I will keep watching for your cookbook but regret to say I am avoiding your website. I look at this site on my iphone and have no problems. More likely you just have a slow internet connection. Made these for my family yesterday…they were amazing. 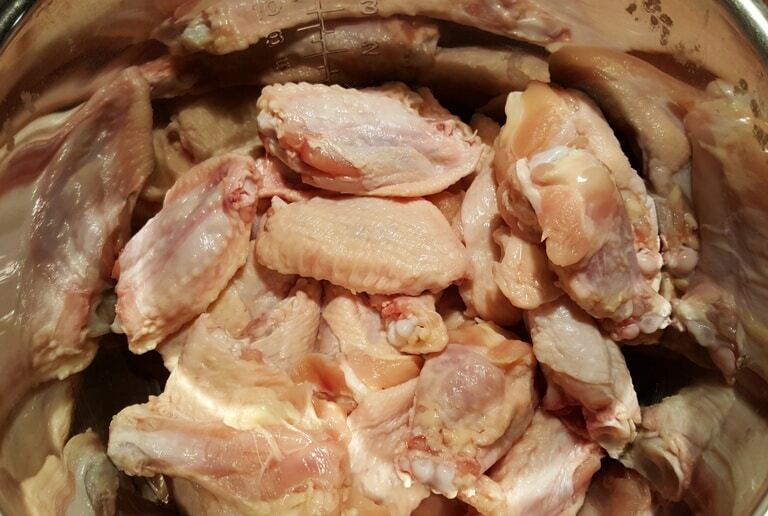 I used a combination of wings and drumsticks, all completely frozen. I just adjusted the cooking time and the length of the natural release. I finished them on the bbq using a copper mat. They turned out beautifully, this recipe is a keeper!